I worked on some lua code to be incorporated (or just to create a new file) in the user.lua file of the DA62 to make the SMP fully compatible with this great aircraft. Solve the infamous and frequent double action when we turn one notch of the increase/decrease (inc/dec) knob of the SMP to change target ALT, VS, IAS, HDG or CRS. This solve the problem just for the DA62 for the time being. Add one inc/dec main functions that take into consideration the position of the Mode button of the SMP with some lower level functions associated with it for the different actions. 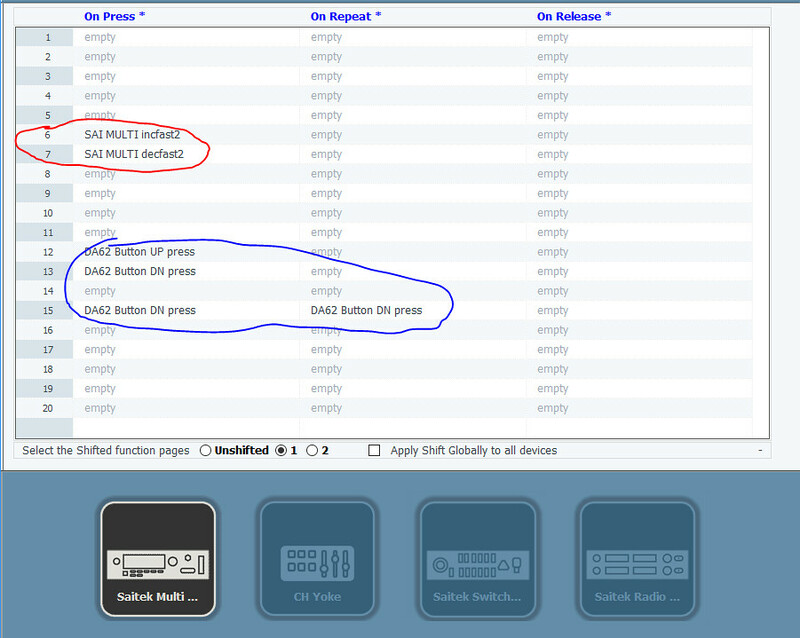 Make sure you have downloaded and installed the latest Linda Vertx DA62 module (version 1.2 at time of this post). Copy the Lua code shown below in a new “user.lua” (or add it to your file if already existing) file for the DA62. If your P3D is installed on the C drive, you will put this mew user.lua file at C:\Prepar3D v4\Module\Linda\aircrafts\Vertx DA62. If you prefer, drop me a PM and I will share the file with you. Red circled functions are mandatory for proper operation. Yellow highlighted functions are part of the new functions included in this user.lua module. Non-highlighted ones comes from the DA62 actions.lua module 1.2 provided by Linda authors. Blue circled functions are up to your choice. The best way to operate the SMP inc/dec knob in the HDG or CRS more is to have the Linda unshifted command associated with normal inc/dec (SAI_MULTI_inc2 and dec2) and the Linda shifted mode associated with the fast inc/dec functions (SAI_MULTI_incfast2 and decfast2). Fast functions move by increment of 30 degrees the HDG or CRS for each click of the SMP knob. They change the VS by 300 ft for each click. And they change the IAS by 3 knots for each click. The ALT functions for normal (+/-100 ft) and fast (+/-1000 ft) inc/dec were left unchanged as the one in the Linda module 1.2 for DA62 were working fine. When using the fast HDG and CRS functions, do not turn to fast the SMB knob as there is some delays necessary between each click to actually perform the change on the VC. The REV Button on the SMP will change an internal Vertx DA62 variable to allow a backcourse LOC tracking. I haven’t found on the Vertx VC how to engage the backcourse LOC mode (it should be automatic according to the G1000 manual) and I sent a question to the developer (awaiting answer). But this provide an interim solution. It’s possible in some conditions to have both the HDG button lit and the NAV or APR buttons lit on the SMP. This is made on purpose and it indicates that the HDG is the active mode while NAV or APR is armed. I defined new functions (not existing in the Linda DA62 module) for the CRS inc/dec in normal and fast mode. They are similar to the ones existing in the Linda module for DA62 for the HDG and ALT modes but using the proper internal DA62 variable (LVar). The new functions for fast inc/dec of the CRS and HDG mode increase or decrease the target by 30 degrees. I found that this 30 degrees increment is quite convenient as you can in a few clicks do large change. A 180 degrees change is just 6 cliks and even if we have to input them slowly, it is faster than making a 180 degres variation in a real airplane. Those fast functions can be associated with a shifted mode of the inc/dec SMP knob through Linda. When in VS and IAS mode, the inc/dec knob will have the same effect as if you push the UP and DN Autopilot buttons in the VC of the DA62. I defined a new function for the multi-mode increase and decrease knob named SMP_MULTI_inc2 (and dec2). 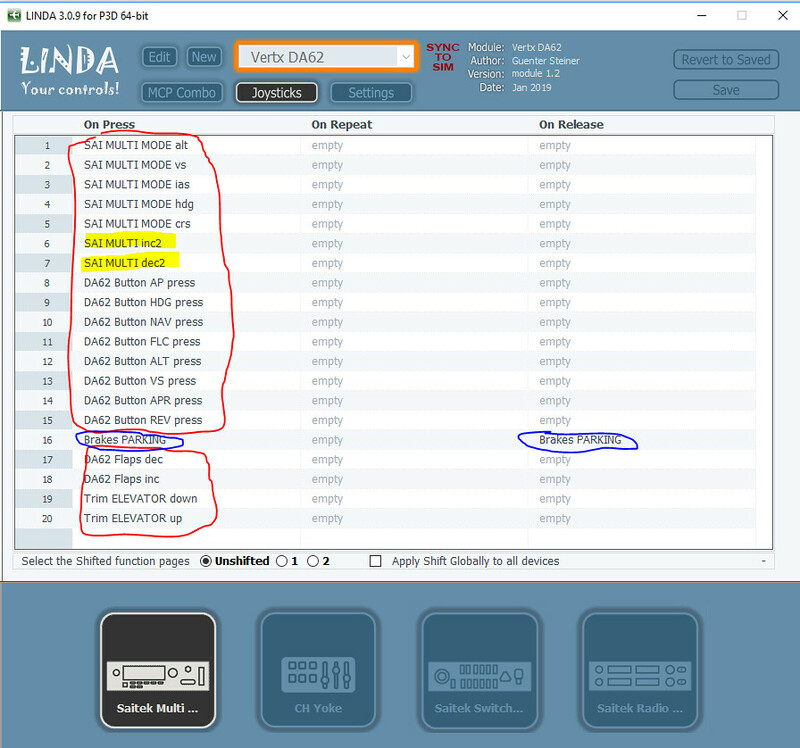 These should not be confused with the function SMP_MULTI_INC (without the trailing number 2) that is part of the Linda DA62 1.2 module. I decided to create a different function as the original one was designed to write also to the MCP combo panel. I don’t own one of them so I cannot see the results of my modification on those display. My Lua code is thus more for people that have only the SMP panel and no MCP panel. Caveat: This implementation of the SMP inc/dec knob cannot replicate the “acceleration” that take place when you turn rapidly the HDG or CRS knob in the VC of the DA62. This is a limitation introduced by the fact that I wanted to remove the double click effect on the SMP knob. Also I found that with Linda, the response of the airplane to rapid change in the knob position was difficult to predict as the VC could take several seconds after we move the SMP knob to finalize the command. This makes very difficult to predict where the HDG or CRS direction will end, especially if acceleration kick-in. In my opinion, the advantage of removing the double click effect are more important than the drawback of losing the acceleration effect. Also, it is always possible to use the VC HDG and CRS knob if in some situation if someone want this acceleration effect to take place for large change. The code for the DA62 user.lua can be found here. Many thanks for your work. If you email me the user.lua I will upload it to the server. Use Linda @ awginfosys.net.